The acronyms are flying with golf club designations these days, and the Nike CPR fits right into the mix. CPR = "Clubs for Prevention and Recovery." Kind of catchy, really. On the one hand, they are designed to prevent you getting into trouble, but if you do, they are also designed to aid in your recovery. The question perhaps then is: how do they do that? 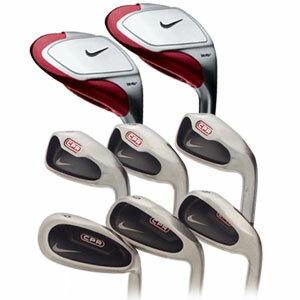 The Nike CPR is a blended set of hybrids and game improvement irons. An 8-piece set, the 3 and 4 are hybrids while the 5-PW feature game improvement designs like a deep cavity back, perimeter weighting, progressive offset, and a uni-flex shaft - all designed for what Nike claims to be "rapid game improvement." That sounds a lot like marketing-speak for "beginner's set" to me. Be that as it may, there is a lot of tech to be found here. Physically, these clubs are, at first blush, reminiscent of the old Burner Bubble from TaylorMade. However, the insert is actually red (rather then copper colored) with the black and stainless color scheme. A little on the large size, these clubs are heavier than some similar offerings. However, after getting a few rounds under your belt with them, that perception will no doubt fade and be a minor consideration. One limitation with the Nike CPR set is that, though they are (technically, at least) available with a graphite shaft, that option is nearly impossible to find, and most you'll see are steel-shafted. For many players in this category, a graphite option would go a long way to improving their game as well. If you are a mid-to-high handicapper, the benefits of a blended set like this are something you should experience first hand. While the Nike CPR is a good choice, many other options exist in this category, including sets from TaylorMade, Cobra, Titleist and others.